I was out with a couple friends last night and we saw some unexplainable lights. I've seen these before in both the location we were in and another location. They most resemble fireflies. There's a similar duration of light, they similarly don't cast light, they similarly meander around. That's where the resemblance ends. The light is blue rather than green (firefly phosphorescence is green and there's a scientific reason for it, I've already researched them thoroughly when I first started seeing the lights to determine if these were a different species from the normal ones). It is much, much brighter. It's actually like those old cube flashbulbs going off. It's a similar size to that, too, although again, they don't cast light onto the surroundings. You'll also see the lights much higher than fireflies will ever go. They'll sometimes be up at the top of 60 foot trees or 20 feet above 30 foot trees, though I've never seen them higher than about 60 feet. I have seen them low to the ground. They'll be seen in all seasons, although they're rare in winter. They're most often seen in late summer and fall and fireflies are mating in early June around here although you'll occasionally see a late bloomer into early July. This isn't a matter of one person's eyes playing tricks on them. I have been with eight different people who have all seen them at the same time I have over the span of roughly a dozen years and in two locations. Last night for sure one of my companions pointed them out so it's also not suggestion. I was actually looking a different direction altogether never even thinking of lights and she said she kept seeing strange lights. I looked where she was, saw one and said "oh, yeah, those. I'd forgotten about those.". There seems to be an intelligence about them. If you talk about them more will come. If you stand quietly, simply observing you might see two a minute no matter how long you look. If you discuss them while you're observing they seem to gather and after ten minutes you will see maybe 50 a minute twinkling all over through your range of vision but always at a distance of 50 or 100 yards. They don't come close and don't seem malevolent or threatening. Has anyone seen anything similar? Ever heard of it? Do you have a name for them or a natural explanation? Oh, interesting. I just did some quick reading because I hadn't run across those (scientific name Phausis reticulata). Their range is about a thousand miles south of me and they emit a steady glow. It's also described a number of times as gentle. Otherwise their habits and the timing is similar to local ones. 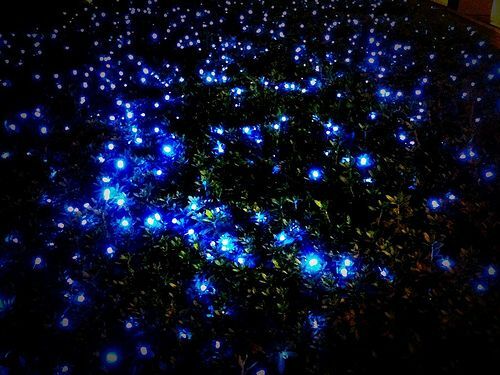 These lights are anything but subtle and they blink like regular fireflies. But that does open the possibility they are an undocumented mutation. That mates in fall and is active year round including at - 30 in the middle of winter. I didn't know about these fireflies. They are gorgeous!!!! How incredibly beautiful. It's possible a mutation has occurred so the light acts differently from other insects. Especially with the things humans have been doing to the planet, it would make sense. Gorgeous colors Mac.This somewhat reminds me of the legendary ghost lights said to be found in Silver Cliff Cemetery in Colorado. I have seen several TV shows about them with the mix of skeptic/believer takes on them. Thank you for the link. I liked it a lot.